It’s not easy being green -- or is it? Sometimes being green can be confusing, challenging and all around misunderstood. Environmentalism is happening all across the globe with efforts focused on energy, water, lifestyle sustainability, waste, youth involvement, climate justice, and everything in between. 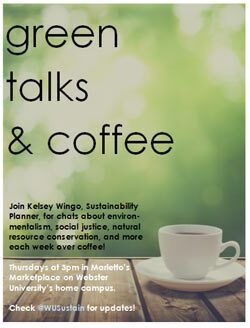 If these talks interest you, come join Kelsey Wingo, Webster University sustainability planner, every Tuesday at 3 p.m. in Marletto’s Marketplace for Green Talks & Coffee - a space for beginners and self-proclaimed experts to explore what being green is all about. Check @WUSustain for updates, and find more Webster sustainability resources at webster.edu/sustain.